The glycemic index, or GI, of a food indicates how quickly and how high a food will raise blood glucose levels. By following a diet rich in low GI foods, such as carrot juice, those with diabetes can work to better manage blood glucose levels. While carrot juice does contain sugar and carbohydrates, because it is a low GI food, it will not cause a rapid rise in blood glucose levels. A diet based on GI can be difficult to follow and, like all diets, may not work for everyone. When you eat carbohydrates, your body breaks them down into sugars called glucose. The body uses glucose for energy. Different foods contain different types of carbohydrates, which can affect how quickly the food is broken down into glucose and used by the body. The GI measures how much a food raises your blood glucose level. Foods with a high GI are broken down faster and may raise your blood glucose levels more quickly than foods with a low GI. Foods with no carbohydrates, such as fats and meats, have no GI rating. Foods that have a high GI can cause blood sugar levels to spike very quickly after meals. You may even feel energized, but the feeling will not last long. When blood sugar levels are elevated, the body releases insulin to help bring blood glucose levels back down. Because of this, high GI foods may perk you up for a short period, but soon after, you will feel very sluggish and hungry. A GI over 60 is generally considered to be high. Foods with a high GI include sugars, syrups, sodas, white bread, cookies, cakes, potatoes, rice cereal, corn flakes, pineapple, pretzels and ice cream. Foods with a low GI are used more slowly by the body. These foods are broken down into glucose, and the glucose is used by the body over a longer period. This results in a slow, gradual rise in blood glucose levels. Following a diet rich in low GI foods may help to keep blood glucose levels lower throughout the day. Because these foods are broken down more slowly, they may also help to control your hunger, which may help with weight loss. Foods with a GI below 50 include beans, milk, apples, peanuts and whole grains -- and carrot juice. The average GI for an 8-oz. 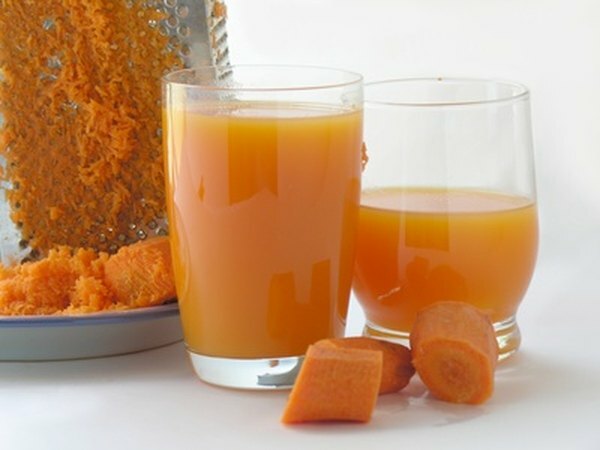 serving of carrot juice is 43, according to the Glycemic Index Foundation and the University of Sydney. Carrot juice will raise blood glucose levels, but because it is a low GI food, it will not cause a rapid rise in blood glucose levels.